The Elbe River has long been important, not only for navigation but also as a border between tribes and countries. Today, it is mostly in Germany although it starts in the Czech Republic. Historically, it separated frequently warring tribes with different religions and even different races of people. In places, the river cuts through limestone formations creating great cliffs along the river valley. The countryside is always green and agriculturally productive. The cliffs and the verdant landscape combine to make this river valley beautiful. Tour Overview: May 2004 and June 2005. 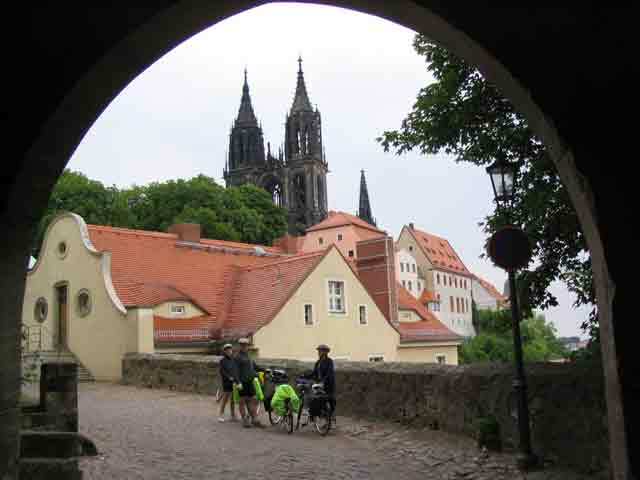 This tour of the Elbe is a 14-day, 540-mile, 870-kilometer tour along the Elbe River. It starts in Bad Schandau near the German/Czech border and continues to the river’s mouth near Cuxhaven on the North Sea. 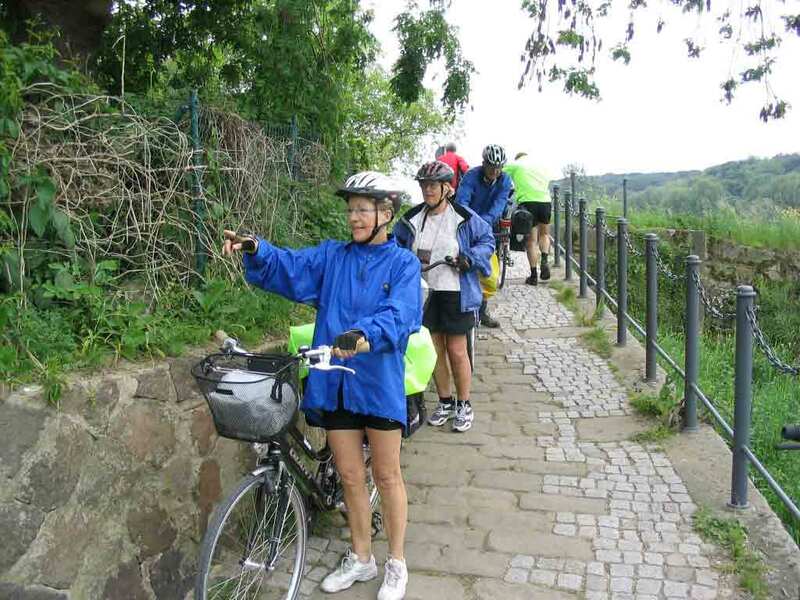 We actually did this tour in 2 stages; the first stage was from Bad Schandau to Magdeburg. It was a 226-mile, 364-kilometer, 6-day ride. 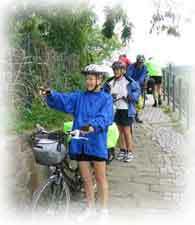 The second stage was the following year and we actually rode upriver from Cuxhaven and ended in Magdeburg. That stage was 314 miles, 505 kilometers, and took 8 days. If you do them together, you can easily combine the two short days at the end our stages to make it only a 9-day ride. We took the second stage backward because we know the prevailing winds are from the northwest and since the ride is almost flat anyway, it will be an easier time for us riding with the wind. 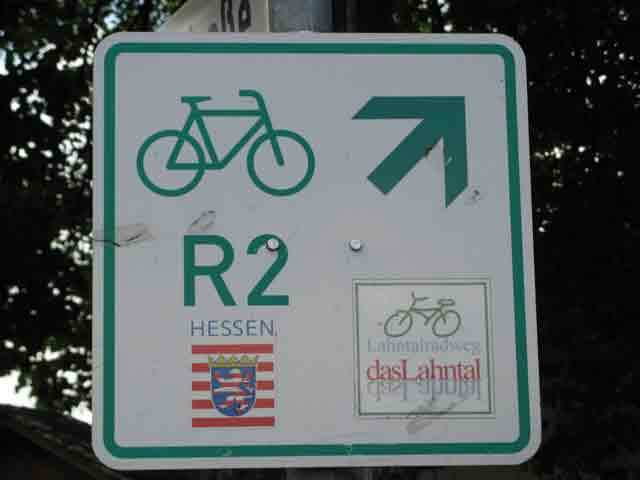 Signage: The entire sign is signed but there are a few stretches where the signing leaves something to be desired, especially between Hamburg and Cuxhaven at the end of the ride. As can be noticed, the type of sign can change but they are easy to figure out. Again, we get lost a couple times but that is part of the adventure too. When you are following a river valley, I never fret about being temporarily off the path because if you know where the river is, sooner or later, you’ll find the path again. 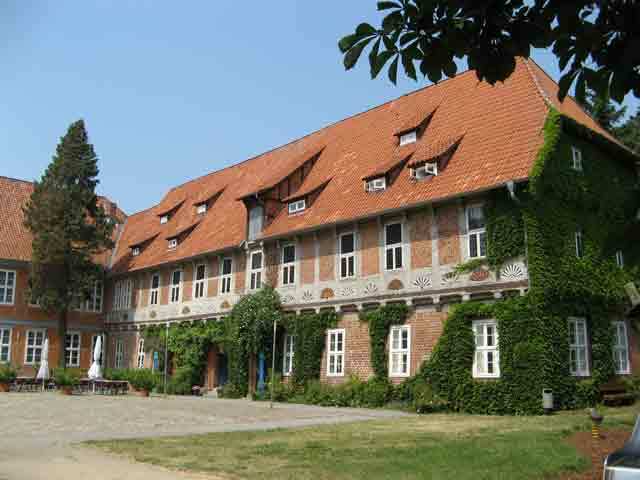 Accommodations: There are plenty of Zimmer or Privat Zimmer and Pensionen along the way. As a choice, we like Zimmer (advertised as Zimmer Frei) but there are also Gasthäuser (Guest Houses), Pensionen (pensions or bed and breakfasts), Jugendherbergen (Youth Hostels), and hotels. For a complete discussion of the different types of accommodations and tips on reservations, see my Overnight Accommodations page. The average cost per night for the Zimmer will be about €45 for double occupancy (the cost for two people to spend one night) but they vary between €30 and €60 (price is no indication of quality - it only reflects competition). Stops: This is an interesting ride. Many of the communities date from the first millennium and many built walls during the Middle Ages to protect themselves from invaders like the Huns but in reality, during the Thirty Year War, the worst enemies were simply the neighbors. Consider stopping at Dresden, Belgern, Torgau, Meißen, Wittenberg, Wörlitz, Dessau, and Magdeburg. 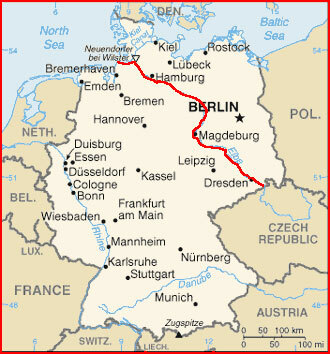 The northern part of the tour one needs to pay attention to Tangermünde, and plan on spending time in Hamburg. We spent two days there but then again, Maxa went to school there from the 1st to the 5th grade. 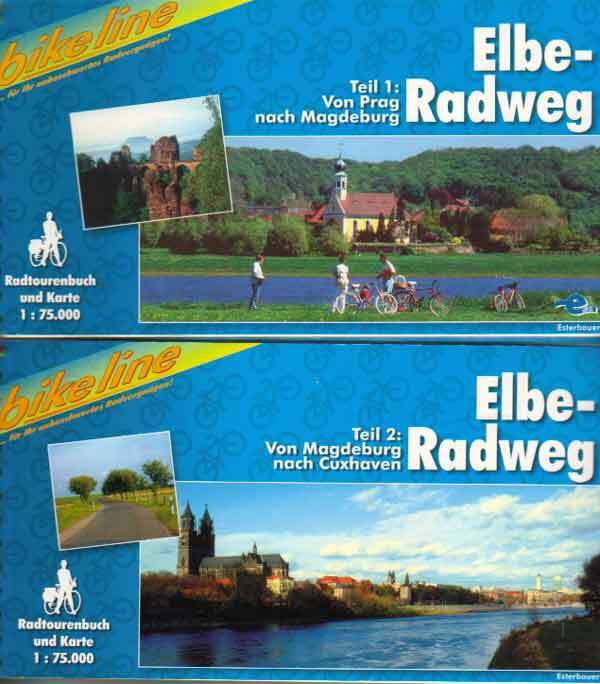 Maps and Guidebooks: On this tour, we used bikeline’s Elbe-Radweg, Teil 1 von Prag nach Magdeburg*, 1:75,000 published in 2000. 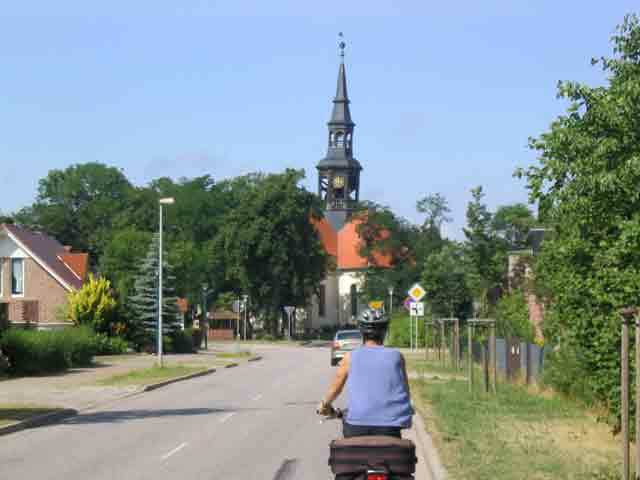 And, bikeline’s Elbe-Radweg, Teil 2 von Magdeburg nach Cuxhaven*, 1:75,000 published in 2001. Always buy the most recent guidebook published because the routes are constantly changing and the accommodations list in the back is frequently updated. The first hyperlink is to Amazon.de and the second is the publisher Esterbauer Verlag. Day Overview: The path today is paved and well maintained however it was rolling for the first 10 miles and we found several 20-foot to 40-foot hills. 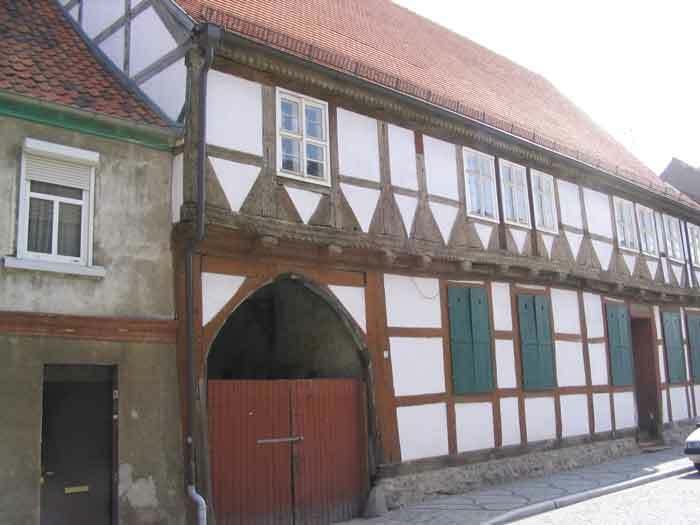 You will see beautiful Pirna and historic Dresden before stopping in Kötzschenbroda just outside Radebeul. Mile 0 (0.0 km): Starting in downtown Bad Schandau, we bike on the right bank (as you look downriver) until we get to the ferry at Königstein. Mile 2.7 (6.2 km): This is our first ferry crossing at Königstein. 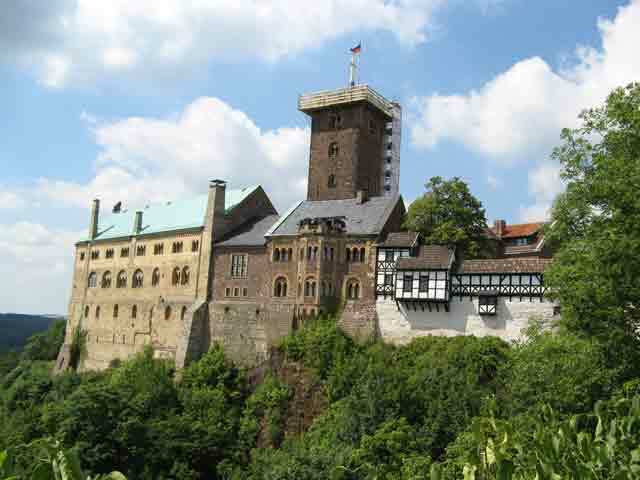 In addition to the name of the little village at the foot of the sandstone monolith, Königstein is the name of the fortress that sits atop it on the left bank of the Elbe. 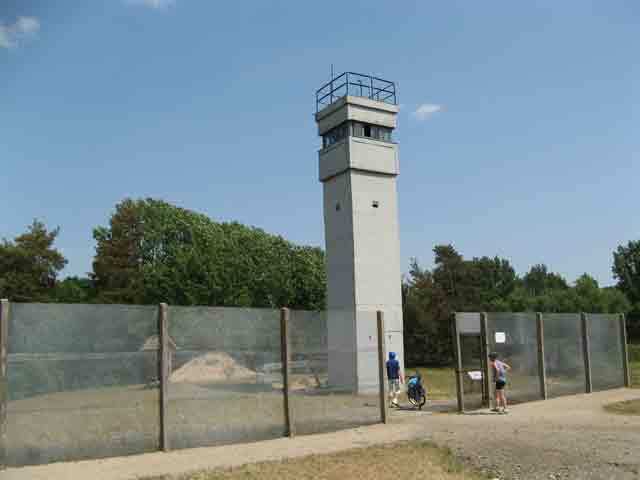 Visible for miles, this 23 acre “Festung” or fortress Königstein was first mentioned in 1241 when it served first as a monastery, later a military fortress, a prison, and a re-education camp for the Communist East Germany. In the days of the DDR, which was the former East Germany, some of the citizens strayed a bit from the party doctrine. When that behavior came to light, the truant citizens were sent here to be re-educated. The length of stay depended on how far they had strayed and how long the local officials wanted to be rid of them. Today, it is a museum and one can take tours. However, if we want to climb up to it, we’d either need a car or a massive attitude adjustment for our wives. We remain on the left bank until we cross the bridge in Dresden. 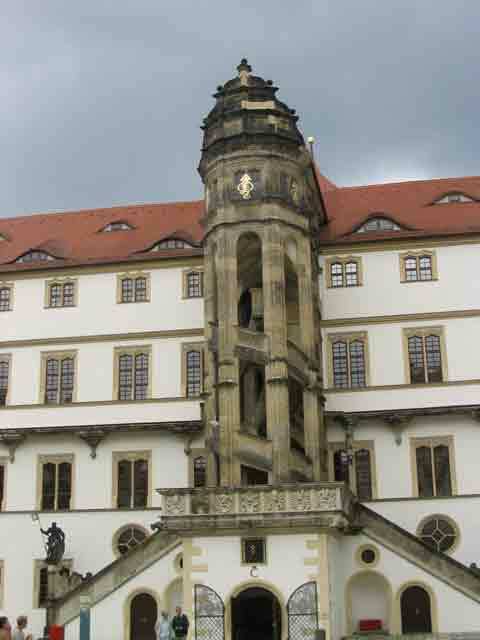 Mile 30.8 (49.6 km): Dresden is at once beautiful and historical. 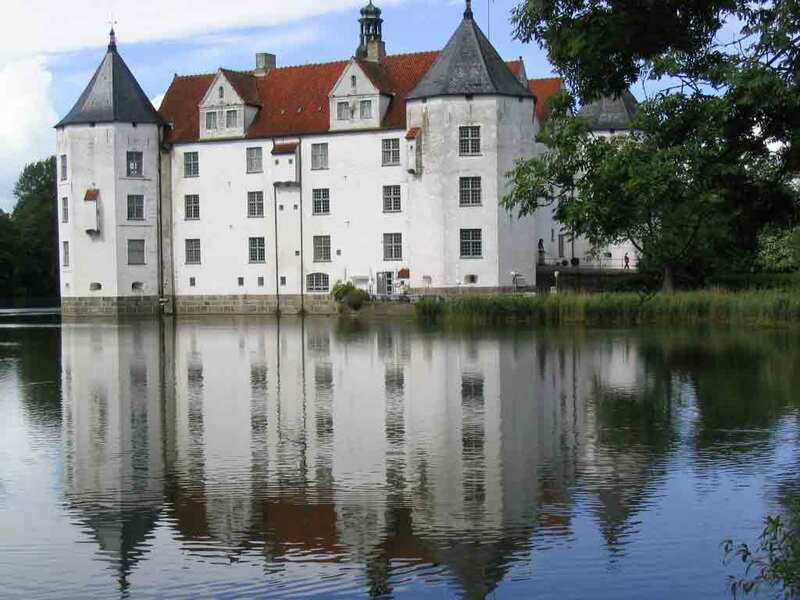 A power center of Germany for centuries, there are many grandiose buildings and museums. On Augustus Strasse, you will find a mural painted in 1870 called Fürstenzug or Procession of Princes is a 120-meter/334-foot long mural depicting a procession of rulers of the House of Wettin since 1127. The House of Wettin is the basis of the monarchies of several European countries including Belgium, Bulgaria, Portugal, and the House of Winsor in England. Miraculously, this mural survived the February 1945 controversial allied firebombing of Dresden at a time when its population was swollen with thousands of war refugees. The loss of life was between 40,000 and 200,000 people. 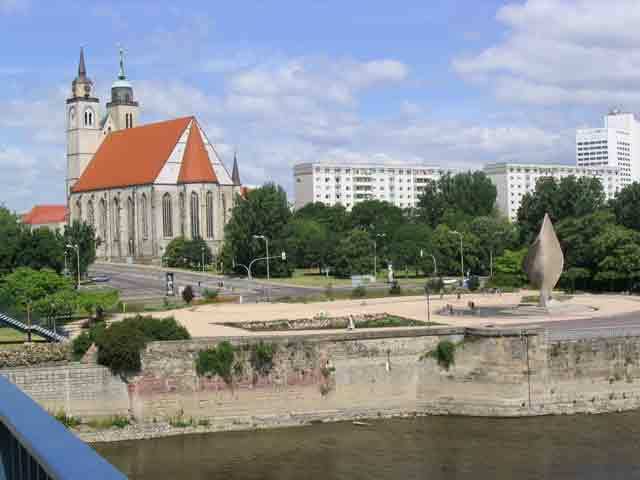 The entire downtown area was destroyed including the grand Cathedral Frauenkirche. Today (2004) the reconstruction is almost complete and will be complete and open for business in the fall of 2005. During the DDR times, the Frauenkirche was left in ruin as a war memorial. 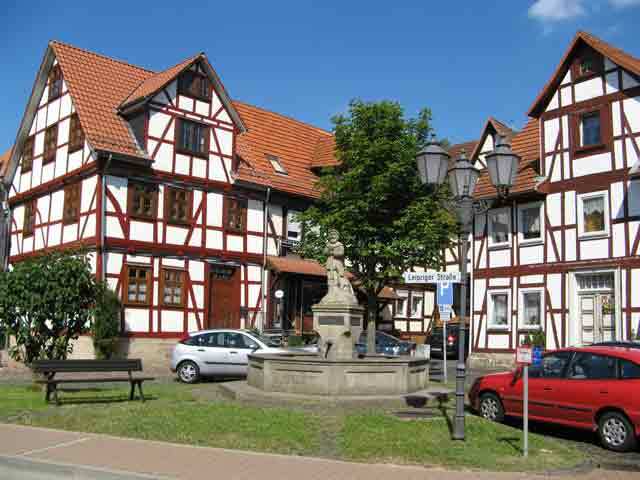 Mile 39 (62.8 km): Just north of Dresden is Radebeul and one of the parts (in German, Stadtteil) of that community is Kötzschenbroda. We stop here for the night because there are many choices of accommodations. We chose Pension Zwiebel in Altkötzschenbroda on Grasteg 1. We enjoyed this community they have many restaurants and Biergarten. Day Overview: The ride today is all paved (except for short gravel parts). However, some of the pavement is rougher than gravel. Part of the path is atop the flood control dike and though paved it is narrow. 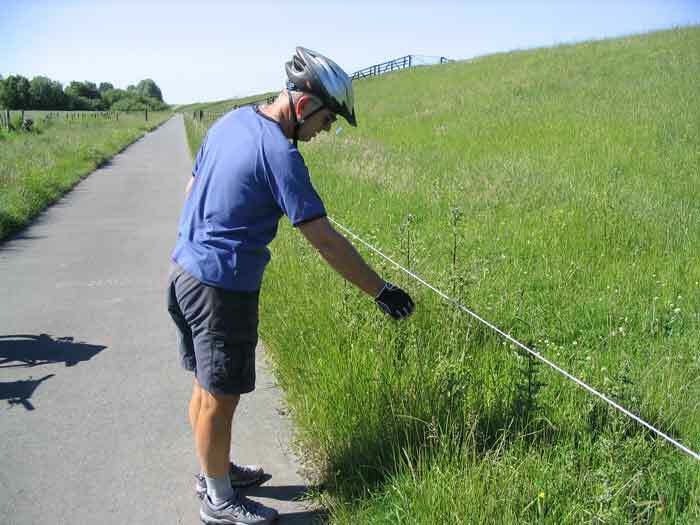 If the bike path is 1.5 meters wide and the average bike is 60 centimeters wide, then two bike passing have just 30 centimeters to spare – that works out to about 12 inches between meeting bikes. Be careful out there. Mile 3.2 (5.2 km): Ferry at Kötits. Mile 9.6 (15.5 km): This is the Altstadt and the center of Meissen (or Meiβen – it’s not a “B” it’s a double “s”). The Cathedral or Dom here is famous and so is the porcelain factory. The Porcelain factory has tours in English every 10 minutes for €4.50. This stuff is EXPENSIVE. Prices start at €75.00 for one cup. Maybe, that’s why I prefer Corelĺe by Corning. I know, the only taste I have is in my mouth – and there is some argument that I have any there too. Mile 22.8 (36.7 km): Steps in the bike path. Steps are too hard to ride over so we have to walk our bikes. We met a group of bikers coming towards us so we had to wait for them to clear the steps before we can proceed. We see this type of thing every now and then on our rides. They give you a chance to dismount and stretch. Mile 35.7 (56.3 km): The ferry to Strehla costs €1.00 each bike and rider. 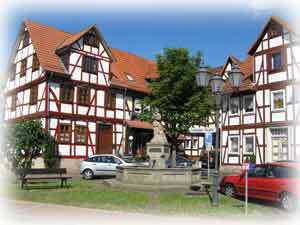 We stop here at Elbhotel August der Starke, Oppitzscher Weg 18, 01616 Strehla, Saxony, Telephone 035264-90863, fax 035264-90864. Small rooms but clean €68 double. €7.20 buys Sauerbraten, yum! Day Overview: Today we plan a short day because we want to spend tomorrow night in Wittenberg. 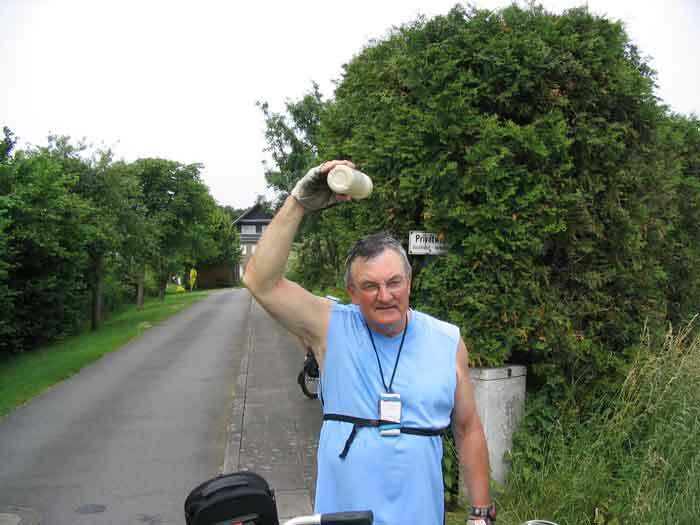 Mile 16.6 (26.7 km): In Belgern, we learn about another Roland. Not the famous Roland who was the subject of the “Song of Roland,” this guy (see photo) was a local hero who saved the town from something. Actually, I am a little confused as I write this. I recall reading something in Belgern about a different Roland but from my Internet search of both Belgern and Roland, I learn that a statue of Roland does stem from the Song of Roland and it has meaning about the freedom to make laws and the right to hold markets during the Middle Ages. 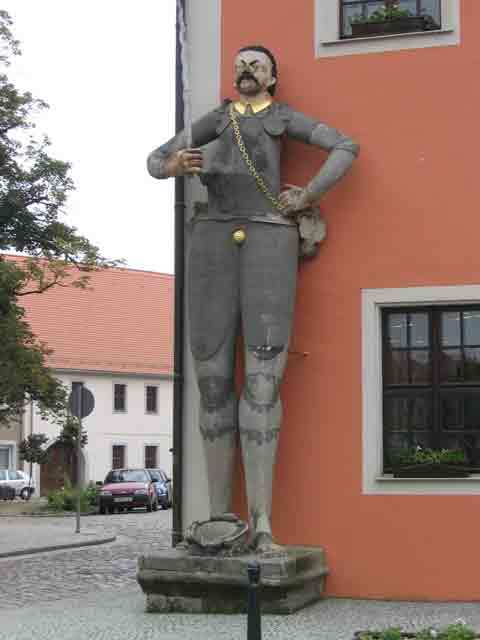 Nevertheless, in 1610, the people of neighboring Torgau (undoubtedly young ner’do-wells and hooligans) swiped the then wooden statute causing the Belgern folks serious consternation. They pursued and caught the thieves and relieved them of their booty. Thereafter, perhaps fearing another attempt, they made the statue from sandstone. It stands almost 6 meters high. The leaders of Torgau, in apology for their first theft, lined up and kissed the big toe of the sandstone statue. Politics! 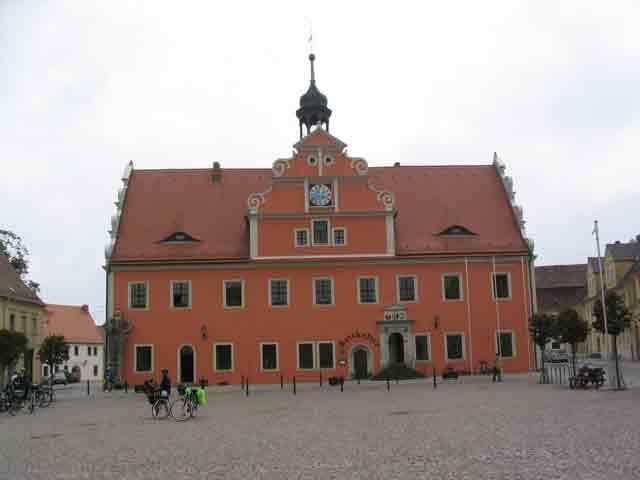 Mile 28.0 (45.0 km): In Torgau, we stopped for the night at Das Alte Bootshaus and enjoyed a visit to their Schloss Torgau nearby. In addition to being a real castle with a moat (now filled with bears instead of water), a drawbridge, and everything. Day Overview: Nice riding today. The path is mostly paved except for about 4 kilometers just before Wittenberg. No hills. Wittenberg is well worth an overnight stay. We were not able to see the inside of the Schloβkappelle (where Martin Luther preached) on the afternoon we arrived so we waited until the next morning to go in. 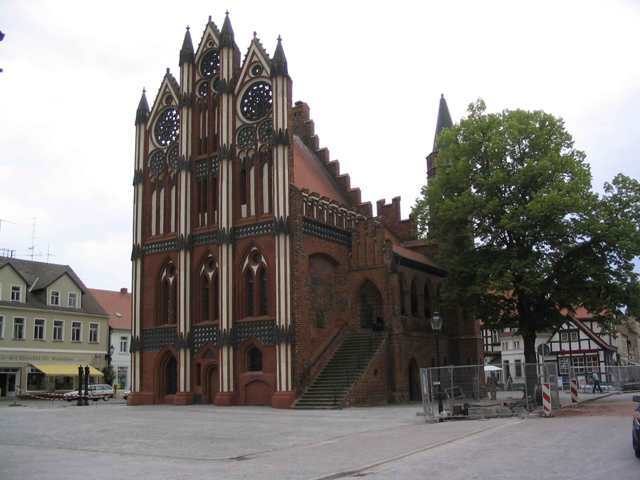 Mile 45.0 (68.0 km): We stop in Wittenberg for the evening and plan to learn a little more about Martin Luther. It was at the palace chapel here that he posted his 95 theses on the door. Although there is some controversy about where he actually posted the list, what I want to know is why only 95? Why not an even 100? Back in those days, everything was written with a quill and an ink bottle. I am guessing that by the time he had written 95, we was tired of scribbling (it was in Latin, you know) and just called it good for the day. To paraphrase his problem with the Church of the day, he simply thought it a bit unholy to let the rich people buy forgiveness by paying for indulgences from the Church. However, it was the money from these indulgences that afforded many of the wonderful churches and ecclesiastic buildings. Is it just me or do I note that since 1517 when he posted his theses, construction of fancy church buildings seem to wane? Day Overview: Again, mostly paved but our guidebook shows a lot of gravel between Coswig and Dessau. Some of the path is quite narrow though. It is as flat as a Pfannkuchen too. Our guidebook also says that the signage after Dessau is spotty, that is certainly an understatement. But then, we think we were off the path anyway. 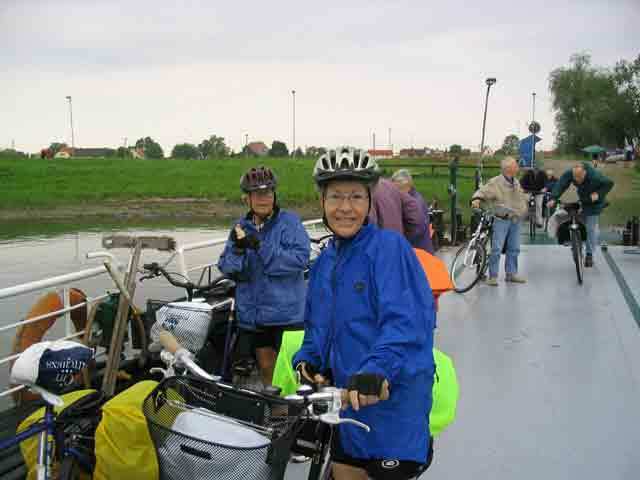 Mile 9.9 (15.9 km): Coswig Ferry. Some of the signage is either faded or broken or, as this sign on the path that would have you turn left to the ferry landing is both faded and broken. Examples of the signage are shown at the start of this page. 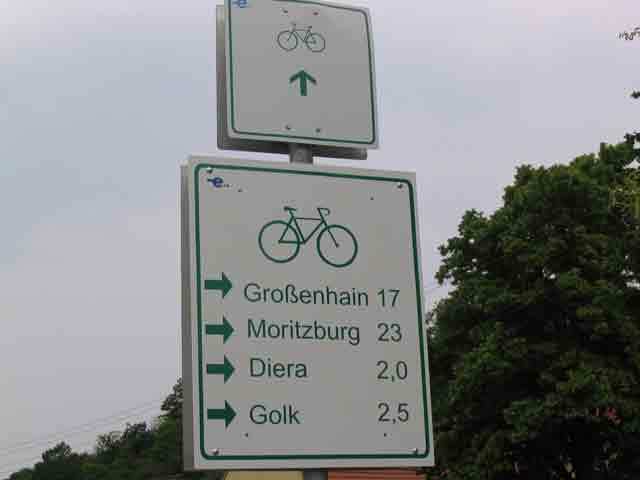 Mile 12.2 (19.7 km): The map shows gravel path between Coswig and Wörlitz but it is newly paved. The Schloβ is from 1769. Mile 21.1 (33.9 km): This is Dessau. Mile 35.4 (57.0 km): After brushing a wall in Kühren, Maxa does a summersault into a drainage ditch. Because she did not let go of her bicycle handlebar, it landed on top of her at the bottom of the ditch. Eckhard and I remove the bike from on top of her and pull her out of the water at the bottom of the ditch. It has been raining hard so the water is about 8 inches deep, plenty deep enough to soak her clothes through and through. 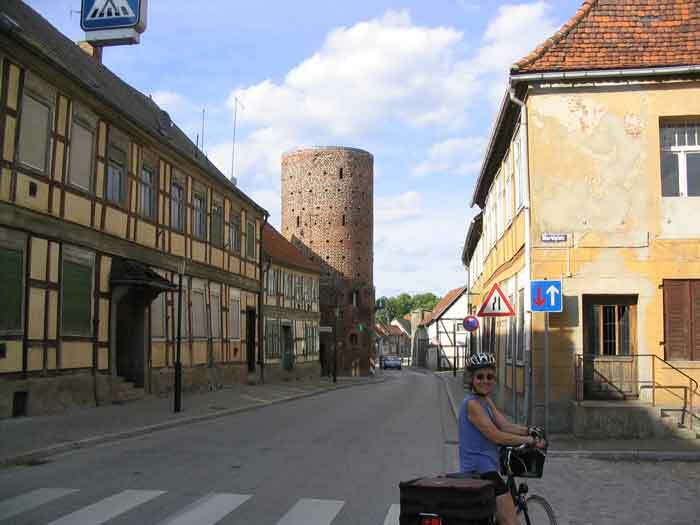 We bandage her road-rashed knee and pedal on another 12 kilometers to our lodgings for the night in Rosenburg. By the way, "road rash" is the abrasion you get from sliding along a road. Road rash can be avoided by staying upright, or, the German imperative, bleib senkrecht. 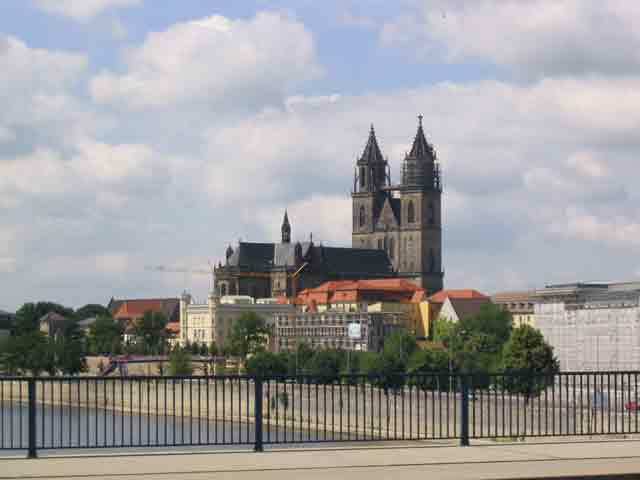 Mile 43.5 (70.0 km): Klein Rosenburg is next to Gross Rosenburg and both are at the confluence of the Saale and the Elbe. 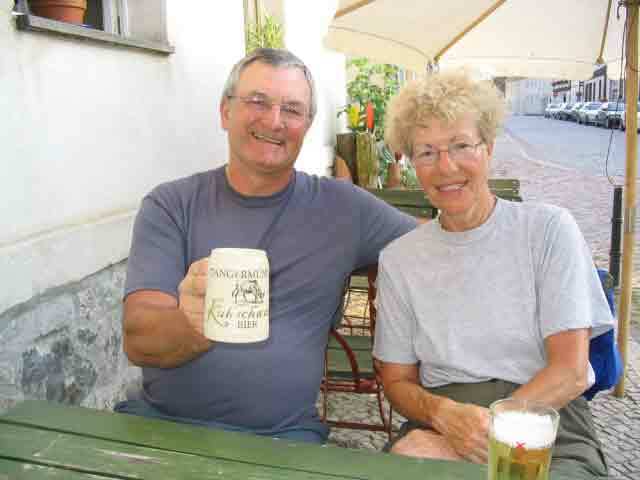 We overnight at Pension Rosenburg; address Klein Mittelstr. 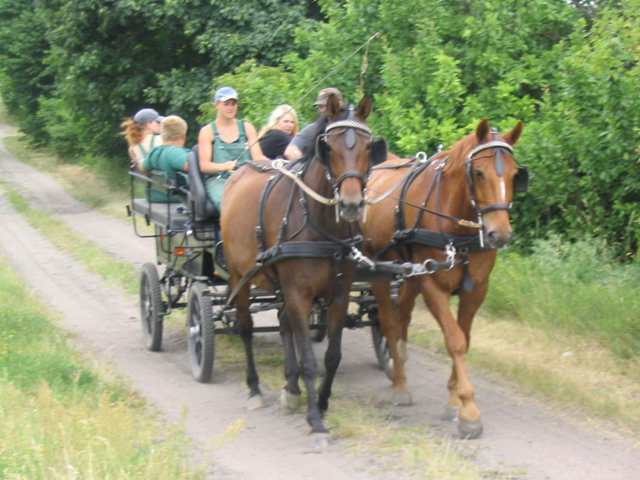 20, 39240 Klein Rosenburg; owner is Dirget Wiegand; Telephone (+49) 0177 - 7 36 74 66; email is pension@rosenburg.de. They charge €24.50 per person in a double room. They also have great food but they are closed Saturday and Sunday (Ruhetag). 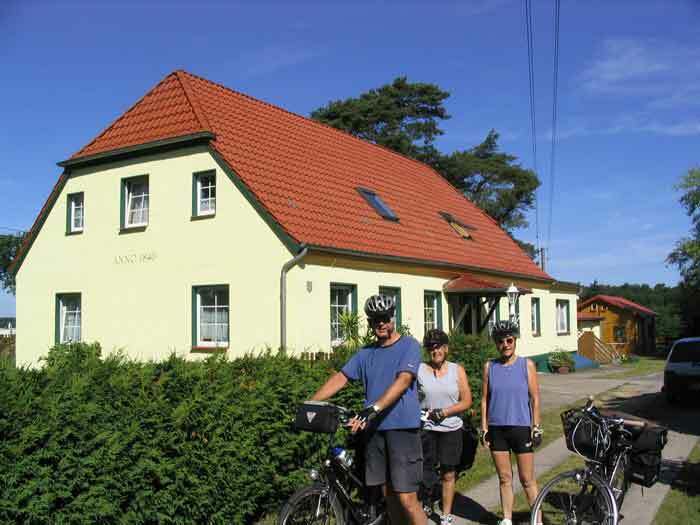 This is a Bett und Bike accommodation, which means that they have bike tools and know the local routes, etc. Day Overview: We start at the confluence of the Saale and the Elbe (sometimes called the Thüringische or Sächsische Saale because there are two rivers in Germany named Saale). 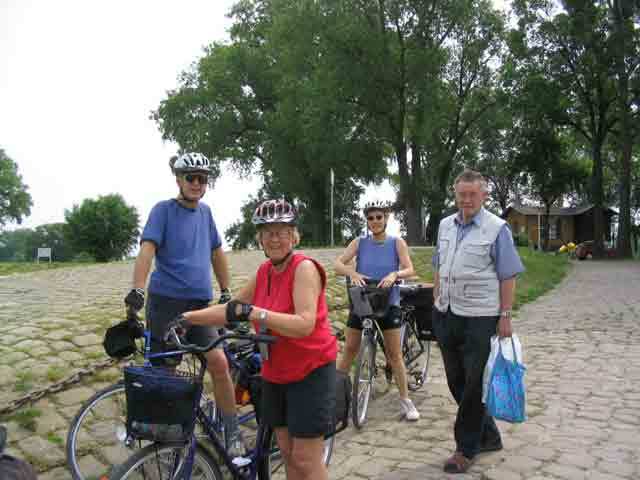 First we cross the Saale on a ferry, and then we bike overland to Barby and cross on another ferry before we can ride north along the Elbe again. Expect some primitive path conditions today. Besides cobblestone, you’ll find cement plates with rough joints that are called Plattenweg, pavement, dirt, and the worst of all is deep sand. There are some hills north of Dornburg in the recreation area near Pretzien. Mile 18.8 (30.2 km): After two ferries and some challenging road conditions, we ride through Pretzien. From here we take an alternate toward Plötzky. Once there, we take the main road into Schönebeck. There is a path along the side of the road. Mile 32.9 (53.0 km): We stop at the city limit sign for pictures. This is the last day we have with Eckhard and Vivi-Anne until we get back to the Seattle area. We’ll spend the night here and tomorrow take two separate trains, they will train to Frankfurt and Maxa and I will train to our German home in Kassel. We aren’t going to mention our accommodations this evening but I will say they were inexpensive. Enough said. Mile 36.7 (59.0 km): Magdeburg Bahnhof. This ends the first stage of the Elbe River Tour. 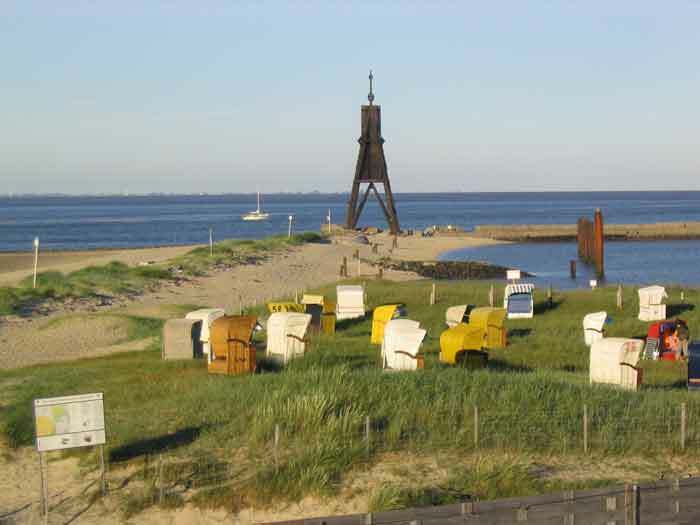 Second Stage: The second stage was done the next year and we actually started in Cuxhaven. If one started in Bad Schandau and followed the river all the way to the North Sea Cuxhaven would be the end of the Elbe Tour. 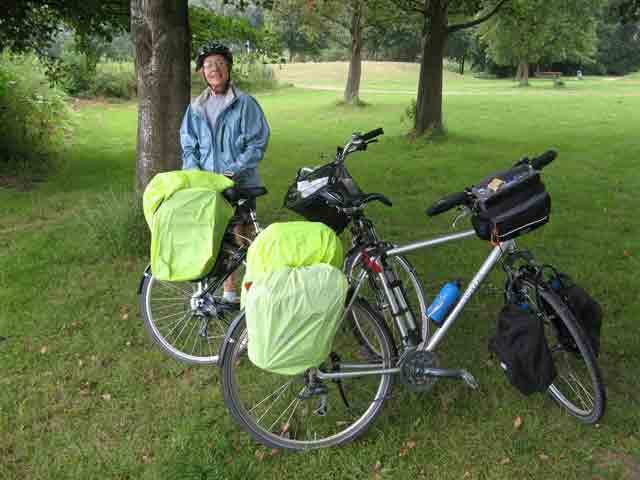 However, the second year, we started in Cuxhaven and rode upriver to Magdeburg. For this webpage, I simply reversed the sequence of towns so one will have some mileage (kilometerage?) that would logically follow after Magdeburg. The actual notes about each little kilometer point follow in the reverse order that we actually rode them. Simply click on the day title and you will jump down to the description of that day. It will be backward but if you stand on your head and look at the text through a mirror . . . well, you will certainly look silly trying to read backward and upside-down. Mile 0 (0 km): Magdeburg Bahnhof. Mile 15.3 (24.6 km): Schartau. We didn’t actually stay here, not many offerings, but we stay in Burg, 5.1 kilometers to the east. Mile 0 (0 km): Schartau. 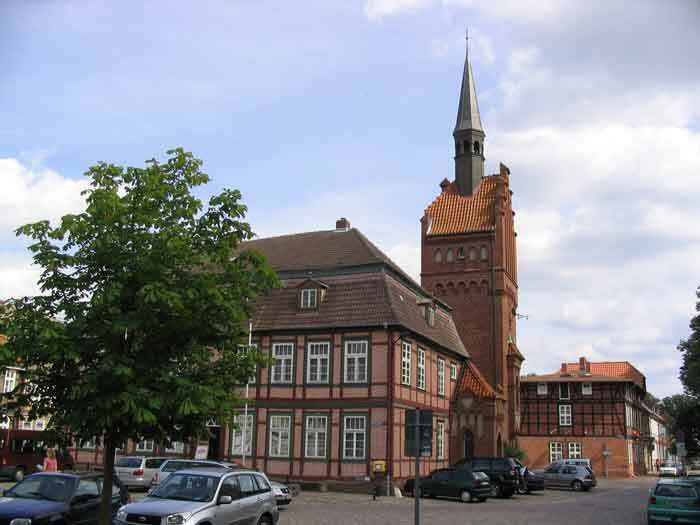 Mile 29.6 (47.6 km): Tangermünde. Mile 0 (0 km): Tangermünde. 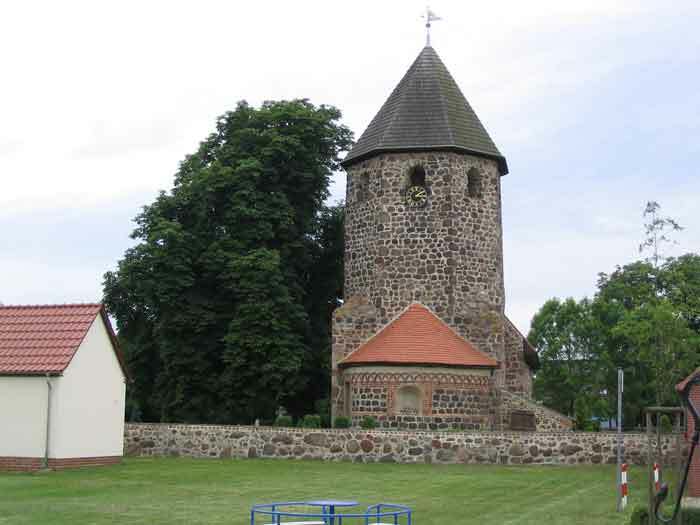 Mile 35.7 (57.5 km): Havelberg. 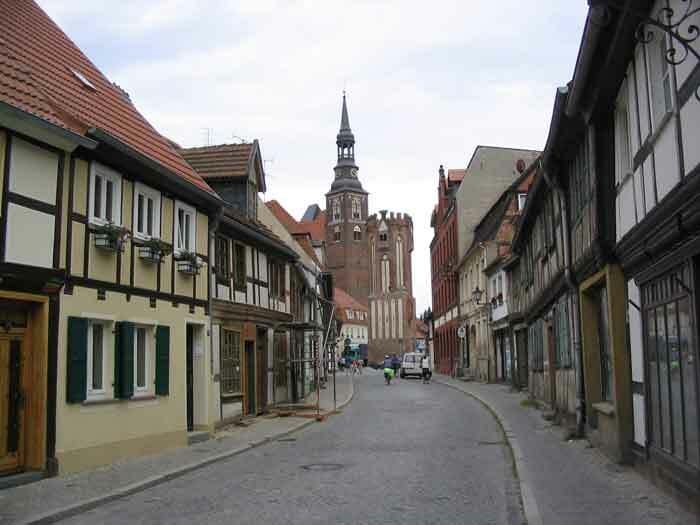 Mile 0 (0 km): Havelberg. Mile 47.4 (76.3 km): Lenzen. Mile 0 (0 km): Lenzen. Mile 55.9 (90.0 km): Bleckede. Mile 0 (0 km): Bleckede. Mile 50.3 (81.0 km): Hamburg Bahnhof. 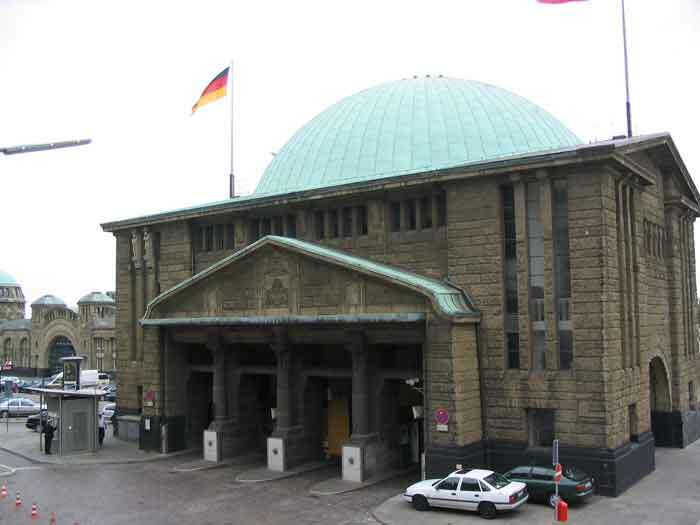 Mile 0 (0 km): Hamburg Bahnhof. 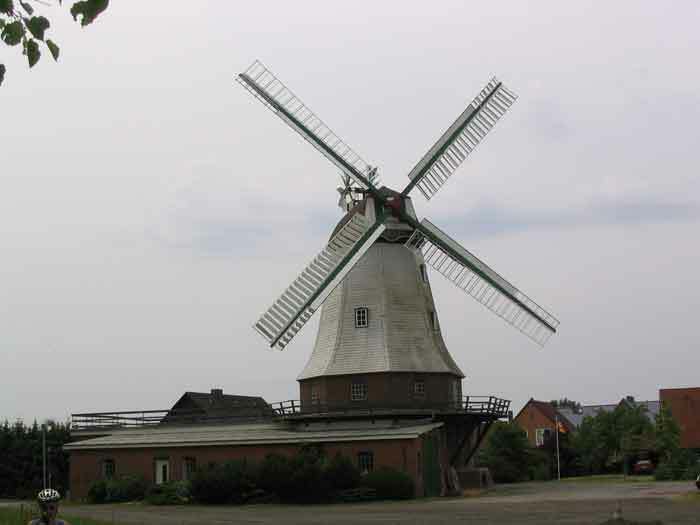 Mile 43.3 (69.7 km): Glückstadt. Mile 0 (0 km): Glückstadt. Mile 33.4 (53.7 km): Cuxhaven Bahnhof. Second Stage: What follows is the second stage that we took the next year. We started from Cuxhaven riding upriver but downwind to Magdeburg. It is backward from the guidebook but it (at least in theory) is also downwind. I’ve hyperlinked the days above to the days below so you’ll have an idea of the mileage and the travelogue. Mile 0 (0.0 km): Cuxhaven Bahnhof. 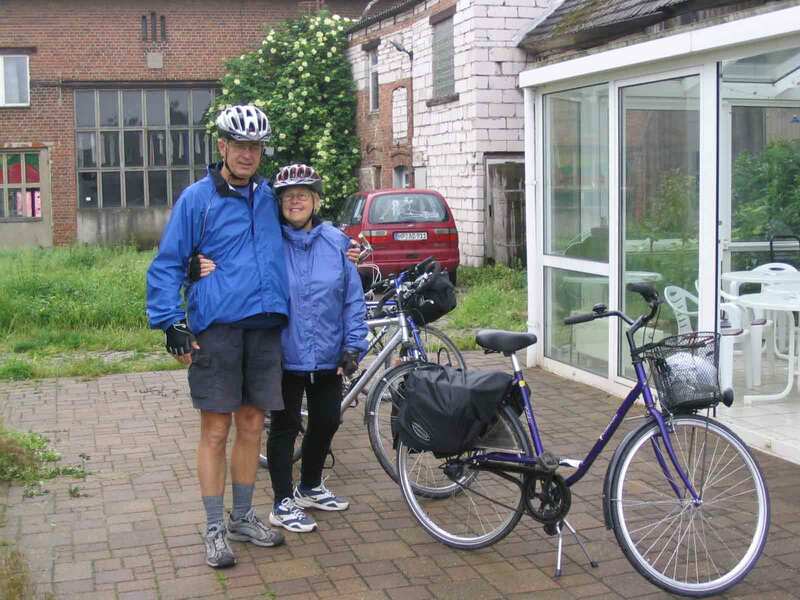 After spending our first night at Hotel Zabel, 78 Hinter der Kirche Strasse, in the Cuxhaven suburb of Döse, we headed for the Bahnhof to meet up with our traveling companions Eckhart and Vivi-Anne. 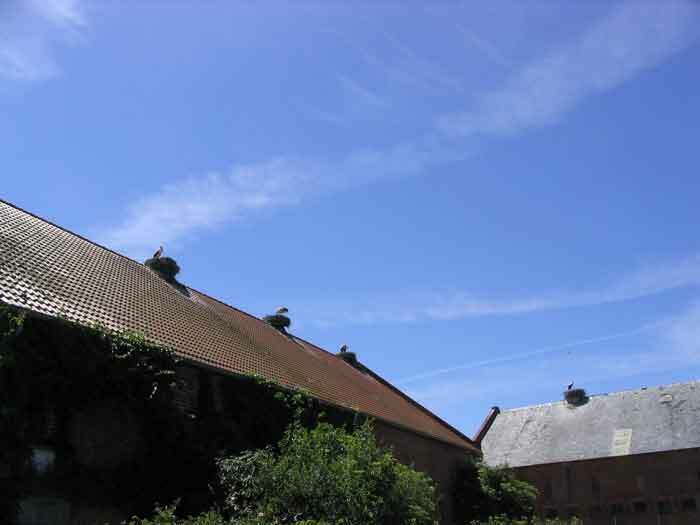 Döse is a little bit east from downtown Cuxhaven but it is a pretty area and close to the beach. 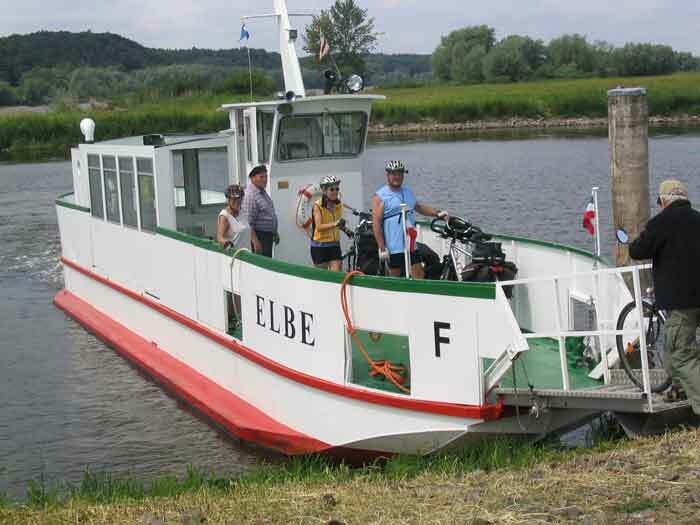 Mile 32.2 (51.8 km): Elbe Ferry, which costs €1.50 for a bike and rider, sails every 30 minutes between May and September. 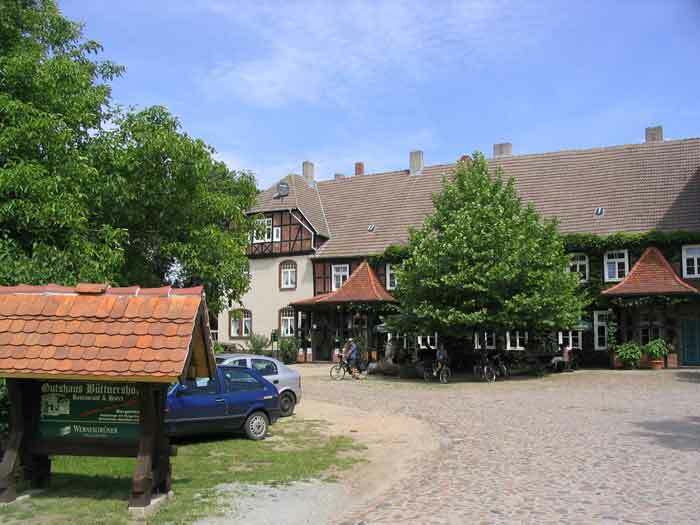 Mile 33.4 (53.7 km): We stop for the night in the middle of Glückstadt at Hotel Matjes; Am Markt 5/6, Telephone 04124-91690, €73.00 for double occupancy (the cost for two people to spend one night). We had a nice meal here of matjes, which are young, supposable female herring. Matjes are in season in early summer and they are fat and tasty. The word “Matjes” is Dutch for a young girl or ein Mädchen in German. Being matjes also means that these herring are virgins. I do not have any idea how the fishermen know this nor how they know which small silvery slippery fish is female and which is male. They must have really, really, good eyes and a very small questionnaire that each fish must fill out and sign. The paperwork! Day Overview: There are no hills today if you don’t count the climb up on the various dikes. There are a couple of stretches of gravel - maybe 15 kilometers in total. We also negotiated about 1.5 kilometers of sidewalk on which we are supposed to walk our bikes. I am not saying we did or not, mind you; I am just not saying. Mile 15.5 (25.0 km): After following the guidebook’s alternative route to Neuendeich (by mistake), we cross the Pinnau river. 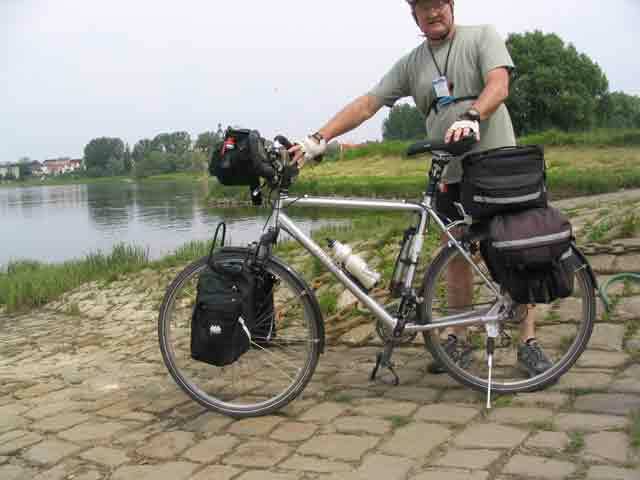 Had we been more on the ball, we would have turned right at Esch and crossed the river at the bridge on the Elbe dike. 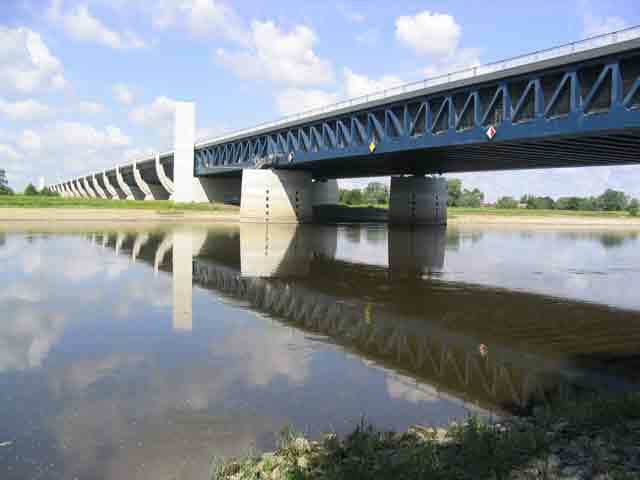 However, if you do make the right at Esch I note that in the guidebook, it says that the bridge over the Pinnau dike system operates hourly Monday, Tuesdays, and Wednesdays from 8:45 PM to 3:45 PM. Thursdays and Fridays the opening hours stop earlier at 1:45 and 12:45 respectively. Saturdays, Sundays and holidays it’s different too. So, maybe it isn’t such a bad idea to ride a little out of the way and cross at the always useable bridge in Neuendeich. Mile 27.8 (44.7 km): On the edge of Wedel-Schulau. Mile 29.8 (47.9 km): This is the northern limits of Hamburg. Notice the representation of the sun here? This is one of those displays made for school children so they can appreciate the scale of the distance between the planets in our solar system. 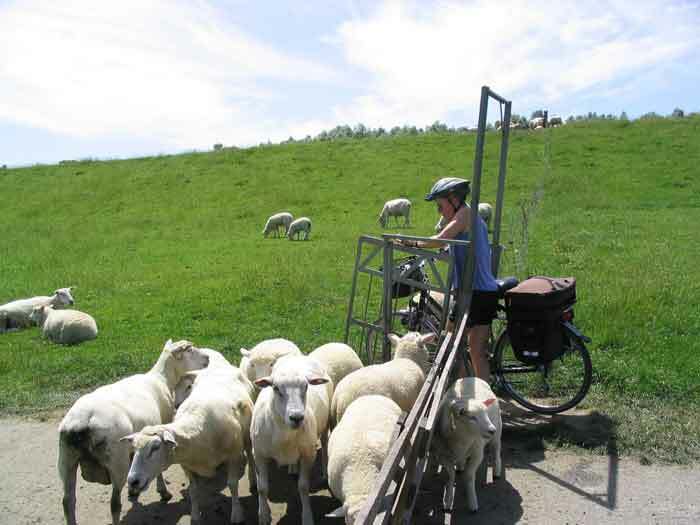 I have seen several of these along bike paths in Germany. This particular model stretches from beyond Glückstadt to the northern city limit of Hamburg. Mile 36.0 (57.9 km): The ferry at Teufelsbrücke. You are about half done with the gravel path. Mile 43.3 (69.7 km): Just past the Hauptbahnhof in Hamburg, we stop for the night at Pension Schmidt, 14 Holzdamn, Telephone 040-2802119 & 2808390. The cost is €65.00 double occupancy (the cost for two people to spend one night). Pension Schmidt is clean but there is some noise from the tracks in the back or the street in the front. Hamburg: Die Freie und Hansestadt Hamburg or in English, “the free and Hanse city Hamburg.” That is what the double HH means on the automobile license plates. We spent a couple days here on our way north to meet Eckhard and Vivi-Anne in Cuxhaven. Hamburg is located at the confluence of the Elbe and Alster and has been a community since Charlemagne built a fort here in 808 CE. Today, the city has grown into a modern metropolis of 1.7 million inhabitants within the city-state. The 1,200-year-old harbor is as modern as they come. 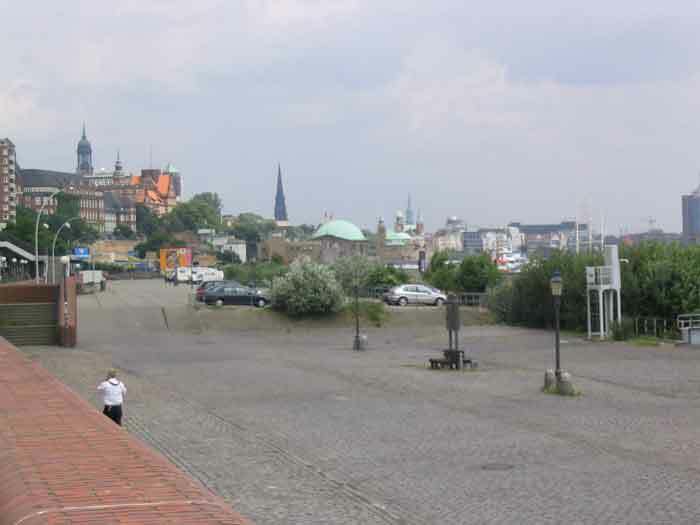 Hamburg saw a growth spurt during the existence of the Hanse or Hanseatic League (about 1300 - 1750). The Hanseatic League was a conglomeration of cities in Northern Europe, mostly along the Baltic, that established a trading monopoly among themselves. They were so successful that the nearby monarchies, especially the King of Denmark, became jealous and tried to abolish the league because it had become powerful as a trade association and more wealthy than the monarchies themselves. 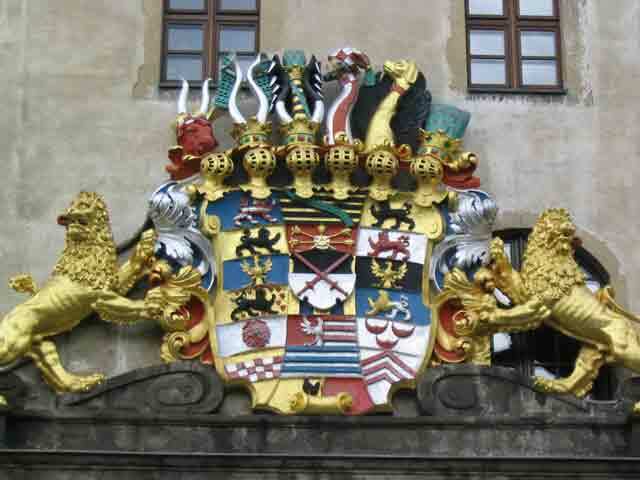 The league, based partly in Lübeck, was able to boycott kingdoms and cause economic strife if the kings, dukes, and earls, did not atone to the trading practices of the Hanseatic League. 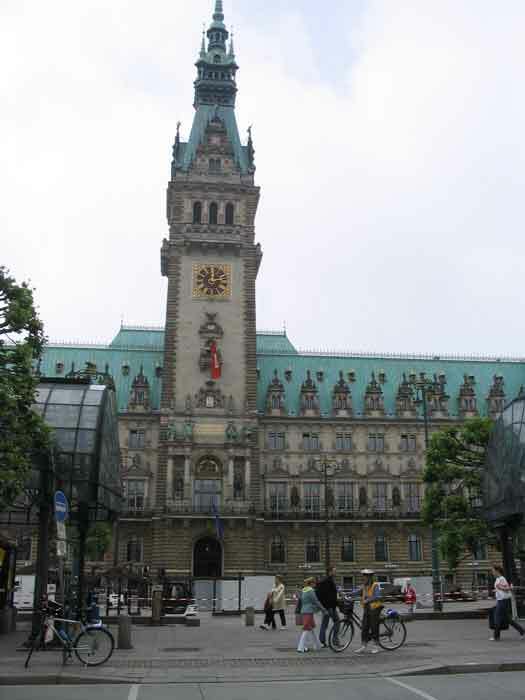 The Hamburg Rathaus or Town Hall was built in 1886 on the site of St. Johannes Closter which was founded in 1230. The preexisting Rathaus was blown up in 1842 in order to save some apartment homes when the city was burning. There are more bureaucrats in Hamburg than in the entire EU government. The Hauptkirche, St. Michaelis ("der Michel" as it is nicknamed) is not only a grand building architecturally it is also the trademark of the city. While it has the 16th tallest tower in Europe at 132 meters, it is only the third tallest church in Hamburg. The tallest is St. Nicoli at 147 meters tall and the next tallest is St. Petri at 133 meters. The Michel was originally built in 1648 but in 1750 it was struck by lightning. 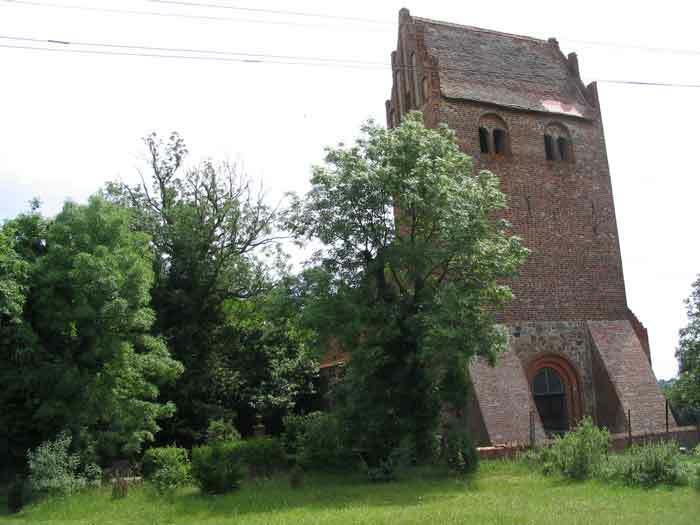 The church burned again in 1906 but was rebuilt in 1907 to 1912 only to be damaged again during World War II. Although the city, like other cities in Europe, suffered several disastrous fires, the worst was during World War II when between July 24th and August 2, 1943, it was targeted and nearly wiped off the map by allied bombers as part of Operation Gomorrah. Approximately 40,000 people died in this single attack. In all, over 50,000 residents died during WWII. Hamburg is also famous for its St. Pauli Entertainment District, especially the Reeperbahn (a street named after the rope makers who plied their trade next to the old harbor). Prostitution is legal in Germany if one obtains a license, but pimping is illegal. The St. Pauli district has many clubs touting the seamier side of life and pimps are evident in spite of the illegality of the occupation. Day Overview: Inside the city of Hamburg, don’t look for signs, they are few and far between. But once outside the city, the signage is normal. The terrain is flat again today. Mile 24.2 (38.9 km): We cross the river on a bridge at Geesthacht. Not realizing we were on an island, I exited the roadway as soon as I could only to be stopped by a local farmer asking where we wanted to go. I told him where we were headed and he explained that we’d have to swim unless we went back up on the bridge and continued crossing the river. We did not have swimsuits with us so we thanked him and took his suggestion. Mile 50.3 (81.0 km): After being caught in the open and suffering through one of the worst downpours in our bicycling history, we ride into Bleckede. Here we spend an enjoyable evening drying out and dining at the Zollhaus, a local restaurant. We are driven to the restaurant by our host who takes pity on us for being wet. 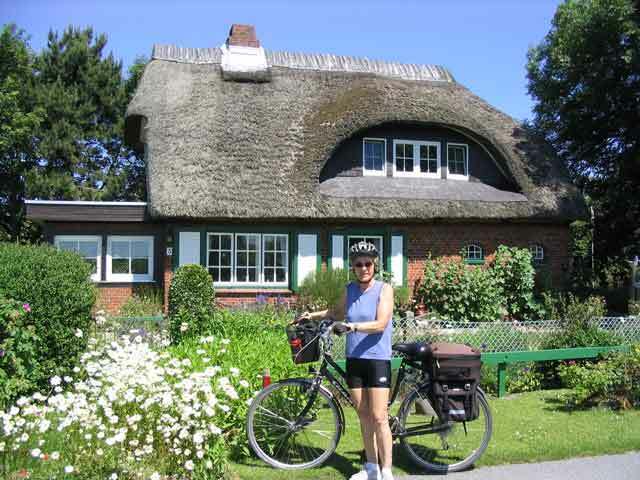 We stay with Frau Strahusen who owns a Ferienwohnungen und Gästezimmer (vacation cottage and guestrooms) at Sannemannweg 1; 21354 Bleckede; telephone 05852-3322, fax 05852-2288 This is also a Bett und Bike accommodation, which means that they have bike tools and know the local routes, etc. The price is €40.00 double occupancy (the cost for two people to spend one night). It is right on the bike path a little bit east of the center of Bleckede. Her breakfast is to die for and in addition to German, she speaks both Swedish and English – which Vivi-Anne (Swedish) and I (American) enjoy. 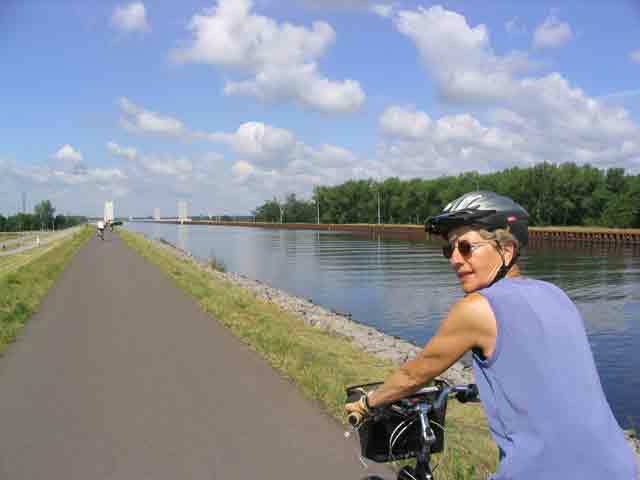 Day Overview: Nice flat bike path along a newly repaired dike on the east side of the river but on the west side of the river you will encounter some hills, some of them are indicated to be steep. Mile 5.4 (8.7 km): After we cross the river on the ferry at Bleckede and set our cyclometer at 0 on the ferry. As we pass through Neu Garge, road construction causes us to take a detour that will be unnecessary by the time you read this. It probably adds 15 km to our mileage. 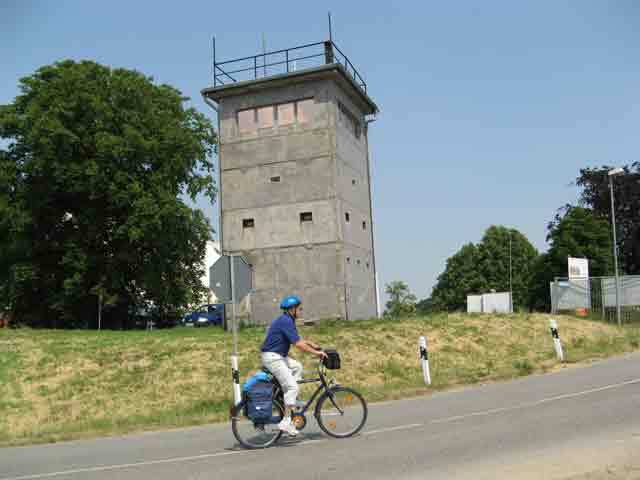 As we cross the river, we are crossing into the former East Germany and there is an old guard tower here. 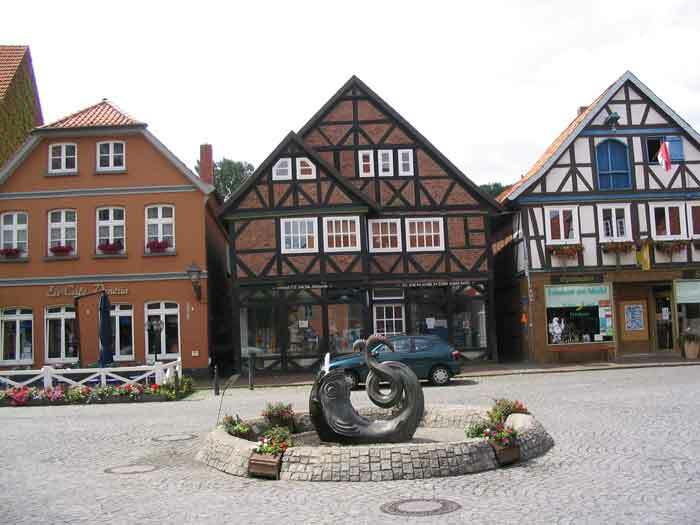 Mile 20.3 (32.7 km): This is Hitzacker, a picturesque town that is well worth looking at. We cross back across the Elbe River on another ferry. Mile 33.8 (54.4 km): Dömitz Rathaus. Mile 50.2 (80.8 km): We are in downtown Lenzen. Between here and Dömitz we rode over about 10 kilometers of either gravel or a paved surface typical of eastern Germany that consists of two parallel tracks made from short concrete slabs with holes in them for handling tools. This kind of pavement is called Plattenweg. While technically this is paved, it is rough pavement and I have ridden on smoother gravel roads. From here, we are given instructions to Hof Janisch am See, which, to our surprise and amazement, turns out to be another 10 kilometers uphill (170 feet) from Lenzen. The address is Leuengarten 1, telephone 038792-7488. The price is €40 double occupancy (the cost for two people to spend one night) including a good breakfast. Day Overview: Leaving Lenzen yesterday, we followed the B195 highway northeast to our overnight accommodation Janisch am See. 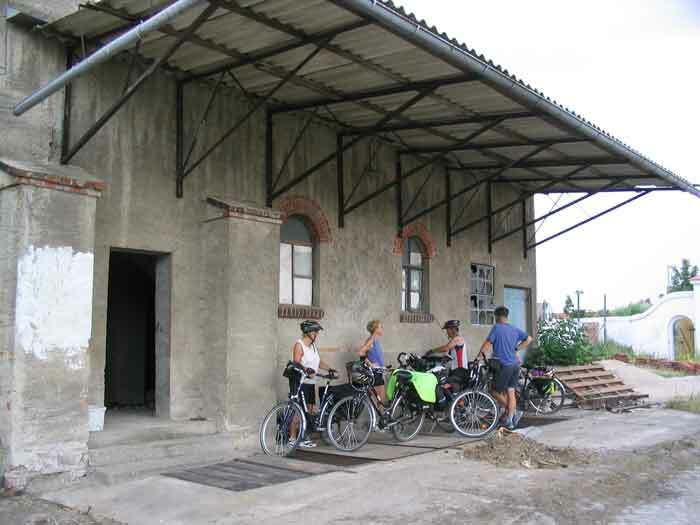 Today, rather than backtrack, we continue on that road to Lanz where we took smaller roads and eventually reconnected with the bike path on the dike. The nice part was that it was somewhat downhill from our Zimmer. By following the dike rather than the trafficked roads, we get a little lost around Quitzöbel and encounter some rough gravel. Most of the dike route is paved that is excellent riding but partly because we got off the trail we have about 20 kilometers of gravel to negotiate. Mile 0 (0 km): This is downtown Lenzen again. As I say above, we do not really go back to the downtown area to reset our cyclometers, I just compute the distance from that point to be a navigation aid to those who use these readings. Mile 11.9 (19.2 km): We are finally back on the dike after taking B195 and sharing the road with fast traffic for about 7 kilometers. This dike has been repaired and heightened after the 2002 flood. On top of the dike the path is gravel but there is a paved path next to the dike on the land side (away from the river). Mile 22.9 (36.9 km): This is the northern edge of Wittenberg. Just a few kilometers south of here is Rühstädt (the name means calm city) where we found a Storcheninfozentrum (Stork Information Center). 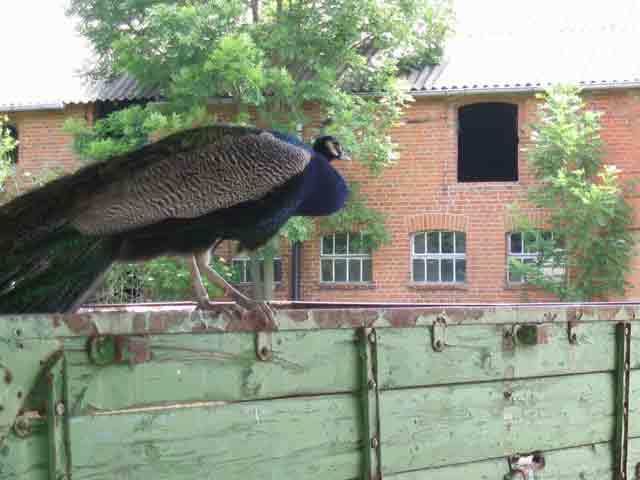 It was fun to learn a little about these seeming ungainly yet stately birds. I have not seen as many stork nests in one place before. 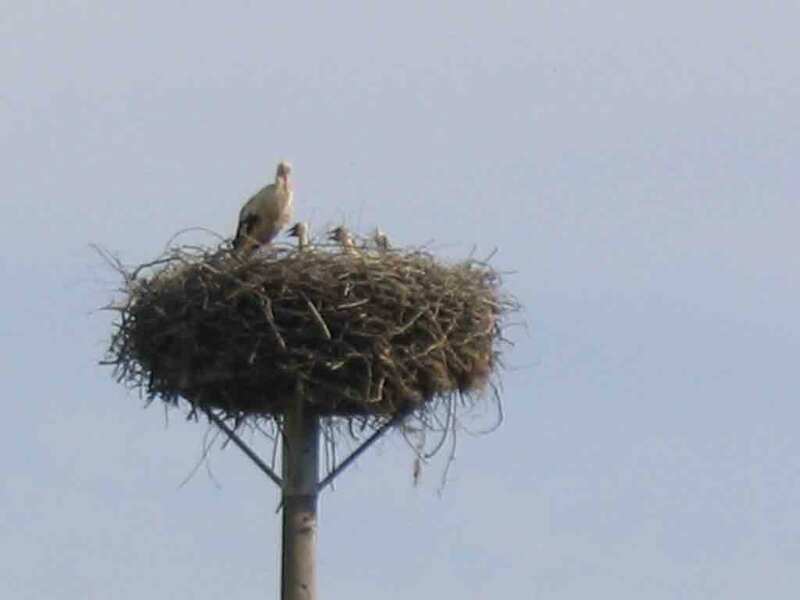 Storks return to the same nests year after year. In the spring after wintering somewhere in Africa or Spain (depending on the stork and his or her travel agent), the males arrive a week or two earlier than their mates. Storks do not have success laying eggs every year. If one or both are late arriving and there isn’t time to hatch an egg and grow the chick to the age where it can fly to Africa for the winter, they just don’t lay an egg that year. Interestingly, after raising the youngster, it is the young storks that first leave the area in the fall. The young storks fly to Africa (or Spain) following only their instincts. 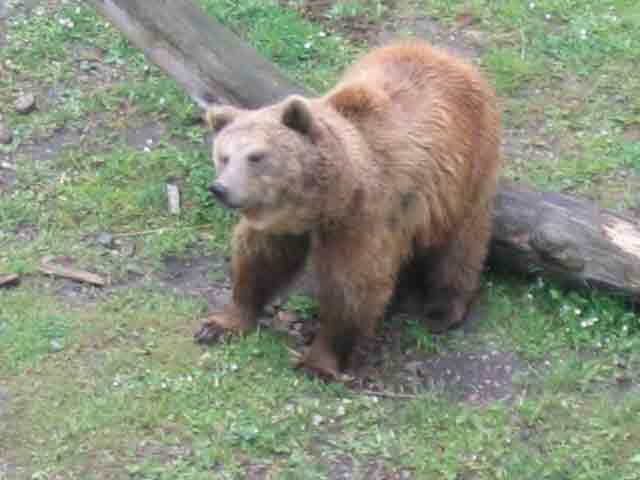 They are then followed two or three weeks later by their parents. 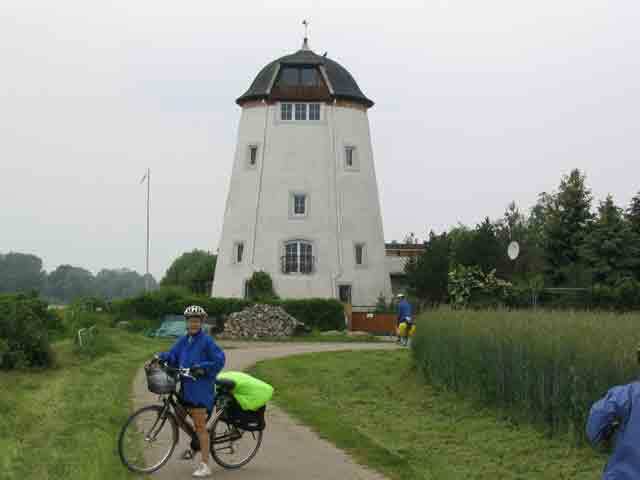 Between Nitzow and Rühstädt, the easiest way for cycling is to stay on the dike and follow the alternate route shown in the guidebook. There is a little wickedly rough gravel along the way but the route is scenic and shorter than staying on the trafficked roads. 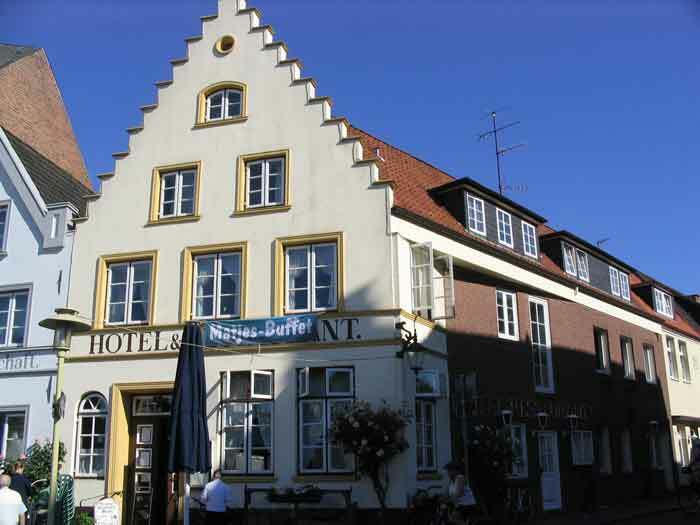 Mile 47.4 (76.3 km): We stop for the night at Hotel am Hafen in Havelberg. This is where the Havel conflates with the Elbe. The Havel starts in the lake district north of Berlin, flows through Berlin where it is joined by the Spree, then joins the Elbe here. 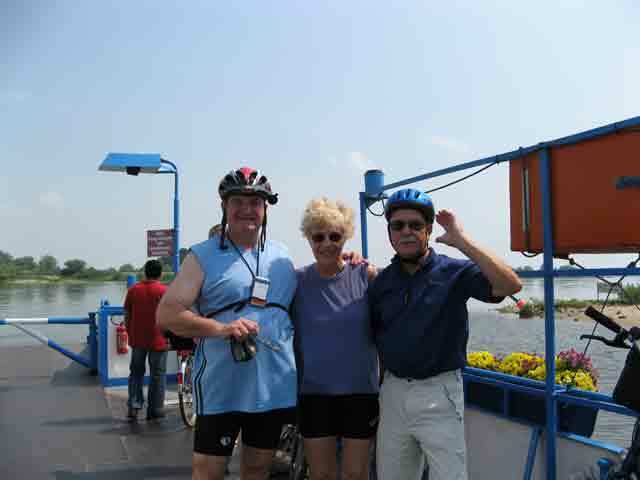 We plan to ride the Havel in 2011. Mile 2.5 (4.0 km): Just after leaving Havelberg, we cross the Elbe at the ferry to Räbel and ride toward Werben. 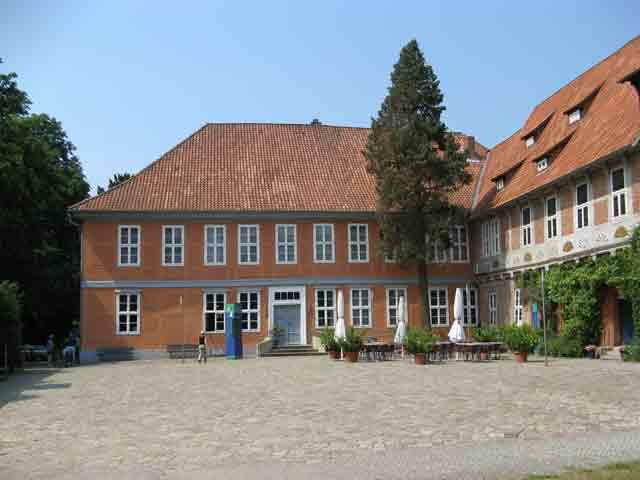 Mile 11.2 (18.0 km): We find a great place for a break at Büttnershof. Mile 14.7 (23.6 km): Rittergut. We are riding west and soon we will turn south, then south-east around a thing identified as a Gewerbegebiet (industrial park), which we learn later is really a nuclear power plant that was completed by the former East Germans in 1989, just as the nation was reunited. Unfortunately, the nuclear plant did not meet the higher Western European standards and so was never started up. Now it sits, rusting. What a waste. 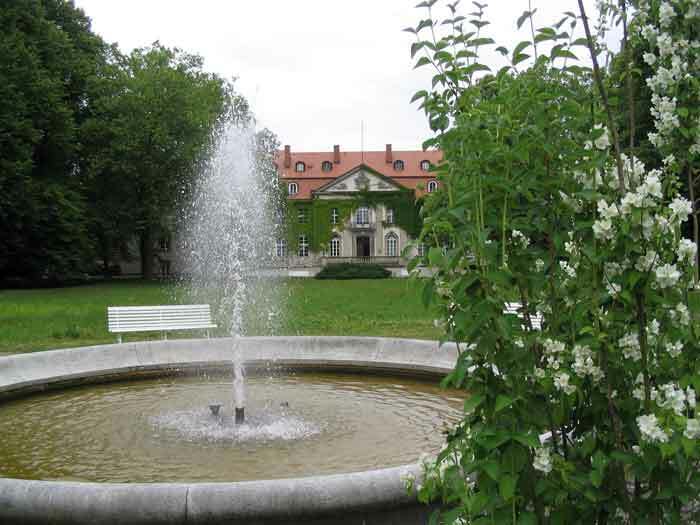 Mile 27.2 (43.8 km): Schloss Storkau is the location of a 5-star hotel and some nice gardens. If it were not a little cold and rainy, it would be another nice spot for a break. 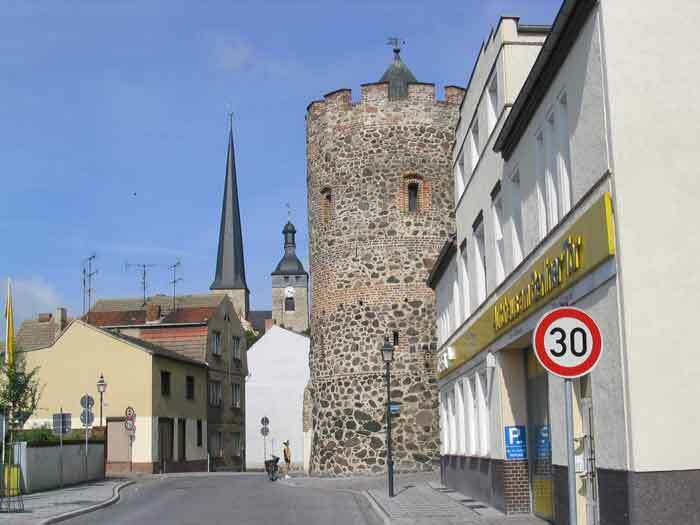 Mile 33.0 (53.1 km): We are at the center of the nearly 1,000-year-old, walled, market town of Tangermünde and an impressive city it is. 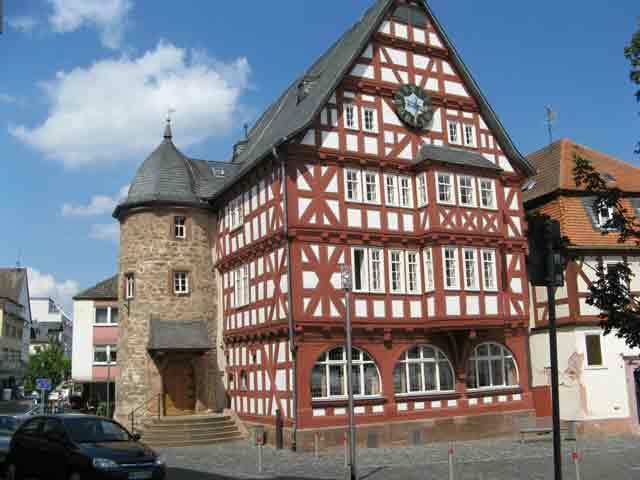 There are many half-timbered buildings and two impressive old church buildings. We spent the evening here and really enjoyed the town. The accommodations here were interesting. Due to a fair in town this weekend, we were lucky to get the last room in town. The host was super accommodating but the building itself needs some work before it can meet the expectations of most western travelers. Nevertheless, we had an adventure and we loved it. Our breakfast in the morning was outstanding and the table was festooned with rose petals and various greeneries from the extensive garden behind the building. We stayed at Pension zum Wohlfühlen. Wohlfühlen means to feel healthy, comfortable, and sated; a sense of well-being. Day Overview: It is flat again today and paved too. What more can I say. Mile 19.6 (31.5 km): This is Kehnert. It is hot today with thundershowers forecasted. We feel like one is about to hit so we take shelter in this former East German Collective Farm. Some enterprising firm has started to turn it into an amusement park for children but stopped shortly after starting. I don’t doubt that the project was someone’s altruistic dream but then stopped by some banker’s vision of the reality of not being able to recapture the money they were about to loan. Mile 23.4 (37.6 km): Another thundershower catches us in Rogätz. This time, the accommodations are much more pleasant. We take cover in a restaurant and drink beer (and tea) while we watch Mother Nature unleash a downpour coupled with half an hour of serious thunder and lighting. At 41.5 kilometers, we cross the Elbe on the ferry here in Rogätz. The cost is €1.00 for an adult with a bike. On the other side, we head towards Burg, off the path perhaps but a town with lodgings. Mile 32.7 (47.6 km): This is the city limits of Burg but our hotel is at the far northeast corner of the city (5 kilometers more from the city limits). I have to say, it’s worth the ride though. Not only was our hostess and host accommodating in every way but they have a covered pool here (unusual by East German standards) as well as a nice restaurant. Even though the restaurant is closed, they cook us a simple meal because the next closest restaurant is several kilometers away. The hotel is called Pension/Restaurant Eschenhof, €46.00 per night double occupancy (the cost for two people to spend one night). Day Overview: A short 15-mile ride from Burg to Magdeburg today. Of course, the path is flat and it is all paved. It’s good that the ride part of the day is short because we need to catch a train back to our home base in Kassel. We’ll be home for supper, as they say. The interesting thing we discover is the relatively new construction of the Elbe-Havel-Kanal. You probably already know that Germany (like France, Holland, and Belgium) is crisscrossed by shipping canals. The Elbe-Havel-Kanal is part of the Mittlelandkanal or the Mid-Germany Canal. Mile 0 (0 km): The day begins with a leisurely ride through Burg. Not a terribly interesting town from a tourist perspective but we enjoyed looking at the buildings anyway. At the bridge, we ride past the Knackebrot factory and the smell is enough to make your mouth water. Knackebrot (aka, Knäckebrot, Crispbread) is the dry rye cracker type product that is popular not only in Sweden but also throughout northern Europe. It’s great for scooping up herring in sour cream. Am I digressing? Is my mouth watering? Anyway, we ride back to Schartau on the bike path and set my cyclometer to zero Then we proceed on to Niegripp. Mile 3.0 (4.9 km): This is where we first see the canal crossing the Elbe River. It is strange to be able to see a boat, floating on water, as if on a bridge across the real river. Mile 14.4 (23.2 km): After a sunny ride through a nature preserve/park on the outskirts of the city, we cross the “Alte Elbe” bridge into Magdeburg. Mile 15.3 (24.6 km): This is the end of the Elbe River ride at the Bahnhof in Magdeburg.